"Easy quiches to take for a quick breakfast." Preheat oven to 350 degrees F (175 degrees C). Line a 12-cup muffin pan with foil baking cups and spray with cooking spray. Mix spinach, egg substitute, Cheddar cheese, onion, green bell pepper, and hot pepper sauce in a bowl. 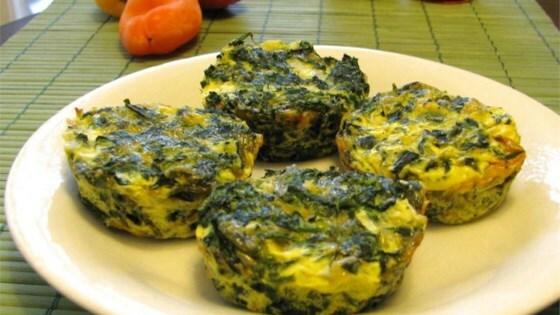 Divide spinach mixture evenly among prepared muffin cups. Bake in preheated oven until a knife inserted into the center comes out clean, about 20 minutes. This recipe is from the South Beach cookbook from many years ago. It's a great go-to breakfast. It's easy to make, freezes well, and is very satisfying.